Tiffany's Online Finds and Deals: Great price on Disney Junior Doc McStuffins Toy Hospital Checkup Center! 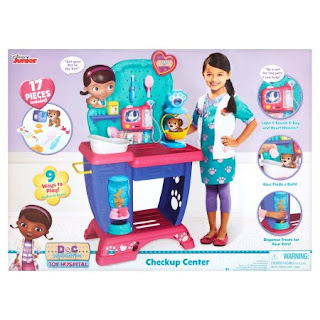 Great price on Disney Junior Doc McStuffins Toy Hospital Checkup Center! Walmart currently has Disney Junior Doc McStuffins Toy Hospital Checkup Center for ONLY $28.68 REG $64.99! FREE shipping on $35+ orders OR do site to store to save on shipping! Kids can pretend to take care of their beloved pet friends and animals with the Disney Junior Doc McStuffins Pet Vet Checkup Center, just like Doc McStuffins from the top-rated Disney Junior series! Future veterinarians will love exploring all the Checkup Centers features and accessories, including Docs pet friend Findo who is ready for his checkup! Kids can slide in multiple play x-rays to activate lights and sounds, use the scale to weigh animals with a removable basket, and give them a bath with a pretend water sprayer. The Pet Vet Checkup Center is also equipped with an electronic stethoscope, kid-powered EKG, otoscope, play thermometer, brush and bandage sticker dispenser to fix boo boos. The patients can get a special treat after their checkup from the pet treat dispenser! For Ages 3+. Kids can slide in multiple play x-rays to activate lights and sounds, use the scale to weigh animals with a removable basket, and give them a bath with a pretend water sprayer. The Pet Vet Checkup Center is also equipped with an electronic stethoscope, kid-powered EKG, otoscope, play thermometer, brush and bandage sticker dispenser to fix boo boos. The patients can get a special treat after their checkup from the pet treat dispenser! For Ages 3+.